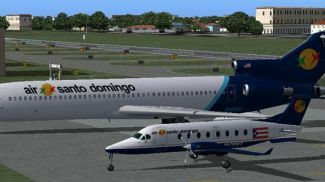 An Air Santo Domingo B727-200 designed for AI traffic. Textures only. Features multiple LODs and moving parts. Frame rate friendly. Model by AI Aardvark. Repaint by Tony Fosler. 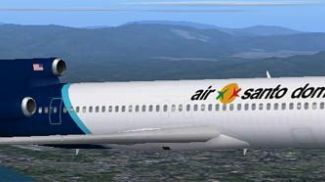 Screenshot of Air Santo Domingo Boeing 727-200 in flight. Just drop the "AIA_727_200_PAINTKIT" folder into your FS2k/4k aircraft folder. Then assign the aircraft to some flightplans and you're on your way. This plane also uses 9 different LOD (levels of detail) models, which means that as the plane gets visually smaller, the model displayed becomes simpler and simpler, thus reducing the drag on your computer. The archive aia72asd.zip has 9 files and directories contained within it.